Is the pimped out HP Pavilion dm4-3000ea Beats Edition laptop worth your money? 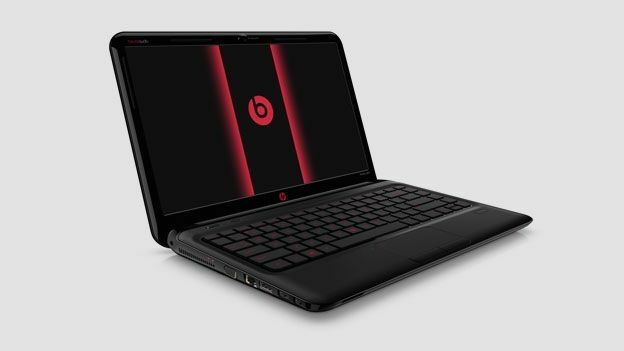 The HP Pavilion dm4-3000ea Beats Edition 14-inch laptop sports Dr Dre's Beats technology, bringing with it a premium price tag. Is it worth the cash? HP's tiny 14-inch dm4 Pavilion range was relatively non-descript but the company has teamed up with the good Dr Dre to add a touch of audio fidelity with its Beats technology. The HP Pavilion dm4-3000ea Beats Edition has been given a beautiful Beats-inspired design upgrade and a specs boost to make it a great addition to the range. What HP tends to do with its mid-price laptop is make good multi-media all-rounders and the HP Pavilion dm4-3000ea Beats Edition is no exception. There are other slightly cheaper laptops, such as the brilliant Dell XPS 14z, which are better value for money and, being in the Pavilion range, the dm4 is no HP Envy, so it's no Apple MacBook alternative. That said, T3 put this bad boy through its paces, running various multi-media scenarios, and we were impressed by its excellent audio - stunning on such a dinky laptop. Decent audio fidelity on laptops does come with one caveat. If you plug in external speakers - even cheap models- it is always going to give you better sound quality. But for audio on the go, you need to make the most of what you've got and HP does that with this Beats Edition. It has superior audio components and a well positioned triple bass subwoofer. The result is cleaner output and a surprisingly far audio throw. In use, despite the slinky dimensions, the Pavilion dm4-3000ea Beats Edition is heavy for a portable laptop. The isolated chiclet keyboard is also great to use for long periods and has the same soft red and matte black hues that adorn the case -shame about the naff multi-touch trackpad. The Beats logo also sits front and centre, which could annoy but the font design is so nice it really works. The 14-inch display has a 1366 x 768 HD LED-backlit BrightView screen that is fine for most brightness conditions except for sunlight, which you're unlikely to see this cold grey winter. We found the coat wasn't too glossy so it doesn't suffer from too many reflections and movie playback worked fine. we streamed HD content off YouTube while multi-tasking and didn't experience any lag. HP has bundled a 2.5 GHz Intel Core i5-2450M processor, a 500GB SATA hard drive and 4GB of memory with space for two more sticks if you fancy an upgrade. The OS of choice is the 64-bit version of Window 7 Home Premium. All enough to keep the HP Pavilion dm4-3000ea Beats Edition ticking over without slow down for multimedia apps. It can even handle light gaming thanks to 1GB of dedicated graphics on its AMD Radeon HD 7470M GPU. Just don't expect to get anything out of Battlefield 3 or Modern Warfare 3. We got 174 minutes of battery life using Battery Eater Pro's Readers' Test. That's good going because it tests the laptop with all performance settings maxed out. If you are just doing some light browsing, battery life will extend considerably. Beats audio technology has really taken off and, what we once thought was a dodgy marketing partnership with Dr Dre, is actually turning out to be superior audio for laptops. T3 already rates Beats by Dre headphones and the same care and attention has been paid to laptop audio with the HP Pavilion dm4-3000ea Beats Edition. The success of Beats means it made perfect sense to the money men to give this bad boy a make over and it works for us. It's not so youth-orientated to alienate potential buyers because it's subtly done - despite the massive Beats logo stamped on the front.